We want to do everything we can to help make your self storage experience as smooth as possible. There are many things to take into account and these are topics we are happy to lend some expertise in as you prepare. Moving is one of the most common reasons people in Southern California use self storage, so what are the main things to consider in the time leading up to my move? What will make the move less stressful? Prepare for your move several weeks in advance. While we are happy to store anything you might be bringing along with you, many people find they can save money on their storage expenses by downsizing. Have a yard or garage sale a month or so prior to your move to shed some excess items from your inventory. Visit the Chamber of Commerce website of your new community: Learn the lay of the land, some history of the city and the locations of parks, schools and other places of interest. Get your paperwork in order. There are many things to consider like setting up utilities, transferring your insurance and even enrolling children in new schools. Many of these things can be arranged prior to a move and makes the moving experience much less stressful. Separate your items. Identify what you will need daily access to while transitioning and what can be put in storage. Some items you’ll need access to, leave the rest with us! Dispose of anything flammable. We are happy to store just about anything, but flammable items like fireworks, acids and matches should not be stored. It isn’t worth the risk. Label your boxes. By writing things like “fragile” “load first” or “heavy” you can save yourself a lot of time later on when loading and unloading items from your storage unit. Pack your boxes completely. Boxes that are only partially full are almost certain to collapse, potentially damaging the contents. Pack the boxes all the way so they will be more sturdy when stacking. 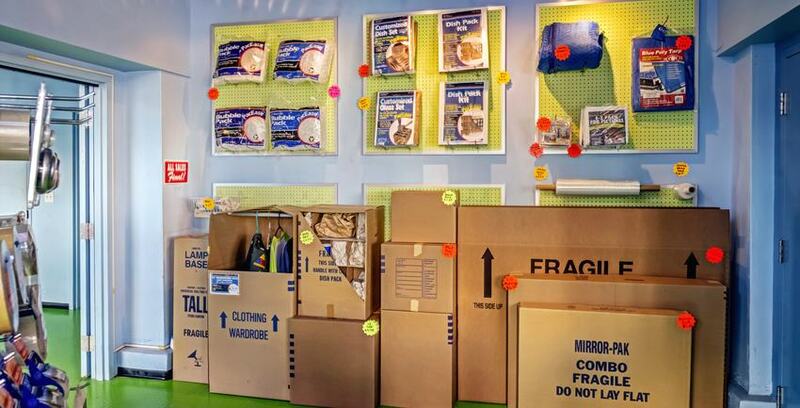 BONUS: All of our self storage locations sell boxes and packing supplies! Take photos of your items. While taking a photo of every last thing is not necessary, any items of value that could potentially be damaged in the process of moving should be photographed prior to the move. Don’t skimp on the bubble wrap. Get as much as you possibly need and ere on the side of caution. There is no sense in having to replace broken items that are not properly protected. Newspaper is also a nice secondary option for plates and glassware. Research moving companies thoroughly. Don’t wait until the last minute to hire a moving company. Take time to research several of them by looking at online reviews and checking out their websites. Once you have narrowed down your options to two or three, call them and ask questions to see what the customer service experience is like. If you do this in advance, you should have no trouble booking the company you feel most comfortable with. If you are thinking about moving yourself, consult your self storage manager as to whether we have a moving truck available at your location. Are there any items that need special considerations when storing them? Dishes: There are specially made boxes for packing dishes and other fragile items. Don’t stress out over the thought of having to purchase entirely new glassware due to moving damages. Lawn mowers: Make sure that if you are storing a lawn mower, or any other item that requires fuel, that the gas and oil are completely drained before putting them in storage. Pillows and blankets: These are actually better to place inside of large garbage bags rather than boxes. Books: No one wants to move a large box filled with books! Use smaller boxes for books and make sure to pack them flat, no standing on their end. Refrigerator: This should be loaded into the unit last because when you leave the unit, you typically will want the refrigerator loaded onto a truck first. Washer and dryer: Leave the door or lid slightly ajar to avoid mold. Wooden furniture: This should be covered with blankets to help prevent moisture. What is the best way to organize my items within my storage unit? While you want to take advantage of as much of the space as possible, leave a small space between your items and the walls of the storage unit for ventilation. Outside of the small space between the items and the walls, pack everything else in as tight as you can. This will protect your items from moisture and dust. If you think there are certain items you might need to access before moving out of your unit, make sure to remember to place those boxes near the front of the unit for easier use. If you have labeled your boxes well, deciding this should be easy. If you are storing furniture, place those items on wooden pallets to help prevent condensation. Hopefully these tips will be helpful for you! Don’t worry, we are here to help make this as easy as it possibly can be. If you make sure to take care of everything listed above, you will hopefully find that your move is not as stressful as it could be.